The best way to experience a new city is with a local, and I met a bunch of them this week as a judge of the “Locals Know Best” contest at the Indigo Hotel. I shared my judging duties with Grammy nominated singer/song writer, Natasha Bedingfield, so needless to say, I’ve had her song “Pocketful of Sunshine” in my head ever since! I’ve met her several times in the past, and as always she could not have been more friendly. Mid-way through we stopped to take a “jewelry break” to check out some pieces a local designer had brought in. There was a bit of a tense moment, (not really, but it makes a better story that way), when we both fell in love with the same necklace. (That’s the cat fight that got your to click through to this article). As tempting as it was to offer to arm wrestle her for it, I bowed out, since I live here and could alway have the designer make me another one. The real fun was with all the locals who came in to brag about the best part of their neighborhood. I learned a lot from a gal who does real estate and started a blog for all the folks she meets who move here from out of town. It’s called Atlanta: 365 Days, 365 Things To Do and it now has thousands of hits a day, profiling everything from festivals to out of the way restaurants. Another man called himself “The Mayor of Ponce” and then told us about all the times he’s been arrested on Ponce de Leon Avenue. My favorite was a woman who drove all the way in from Birmingham for the contest. 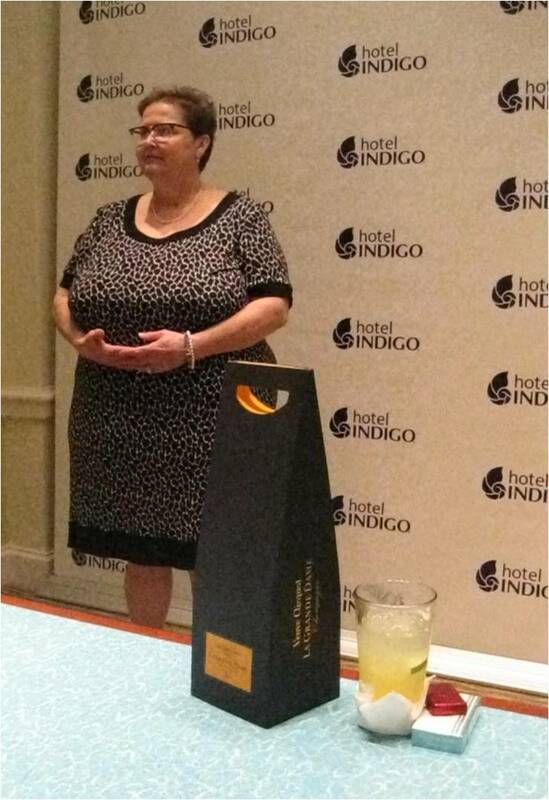 She and her husband love the Hotel Indigo in Midtown, so she talked about drinking margaritas on the patio. In fact, she loves the margaritas so much, she brought one into the interview with her, along with her cigarettes and lighter. I think she brought the champagne for us on the judges panel, but I guess she thought better of it, because she took it with her at the end. If you have something to brag about in your neighborhood, but didn’t make it down to the hotel, you still have time to enter. Just head to: www.LocalsKnowBestContest.com to upload a photo and answer, in 75 words or less, “what makes your neighborhood so great”. For a list of live auditions at Hotel Indigo properties, visit www.hotelindigo.com. 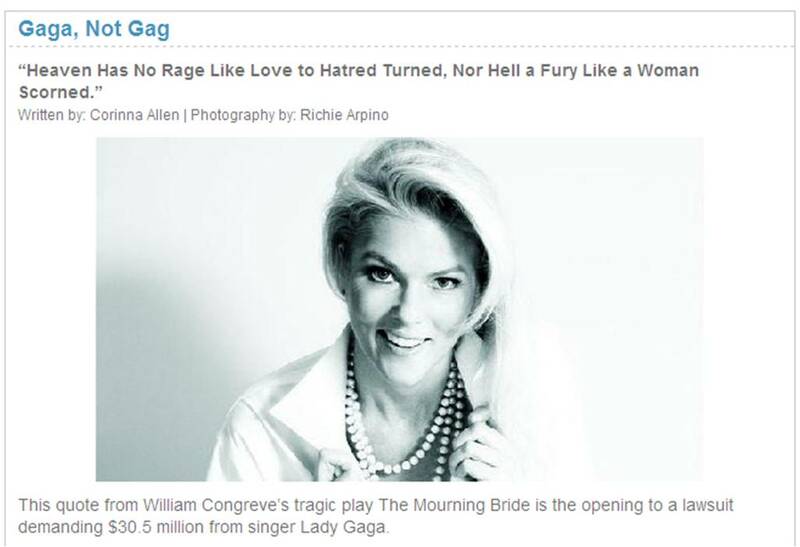 This quote from William Congreve’s tragic play The Mourning Bride is the opening to a lawsuit demanding $30.5 million from singer Lady Gaga. The fact that the suit was filed by her producer turned boyfriend, Rob Fusari, leaves us to surmise the same afterlife-inspired wrath can also come from a man. Fusari says he’s due the money from Gaga, (Stefani Germanotta), because he’s the one who conceived the “Lady Gaga” iconic name and persona, then helped shape the music into the commercial powerhouse it is today. The validity of his claim is supported by the fact that, while she was a mousy 20-year-old when they met, he’d already amassed an impressive body of work that included big name hits like Will Smith’s “Wild Wild West” and “Bootylicious” by Destiny’s Child. But what I thought was interesting is that some reports suggest that Fusari didn’t file the suit until Germanotta stopped taking his calls. It all reminds me of another celebrity break-up — from another decade. Cherilyn La-Pierre was a 16-year-old runaway when she met the man who would create the persona that catapulted her into the elite sorority of women known by just one iconic name. They started out as Sonny and Cher. But while Cher went on to attain a solo career spanning four decades — including an Oscar win — Sonny Bono became a small town mayor. Bono would go on to be elected to the U.S. House of Representatives, but not before publishing a book that portrayed Cher as an “insecure but ambitious ingrate” who would practice signing autographs in front of a mirror. Men can resent a woman’s success, but they can be equally disdainful of women who sacrifice too much. So, I was heartbroken when a mutual friend told me he had another girl with him on the family yacht. My one consolation: I hadn’t sacrificed my career yet, so I was able to throw myself into my work and become more of the independent woman he fell for in the first place. The reality is that in any relationship, celebrity or not, one career inevitably takes a back seat to the other. Unfortunately, when that career belongs to a man, the woman, more often than not, ends up alone. But rather than unleashing a hell like fury, I say, channel that energy into your own success. Then rock your career for four decades and beyond. You are currently browsing the The 40 Year Old Mommy blog archives for July, 2010.